How can the people who don't know what the truth is become loving the truth? On the Poson full moon day, Mahinda thera saw the Sinhalese king trying to shoot deer with a bow. Thera called the name of the king and asked a few questions. "Are there any mango trees other than this mango tree?" "There are many mango trees." " Are there any trees other than this mango tree and the other mango trees?" " There are many trees which are not mango trees." "Are there any other trees than the other mango trees and the trees which are not mango trees?" "There is this mango tree." "Are there any person who are relatives of you?" "Are there any person who are not relatives of you?" "Are there any other person than the relatives or not relatives of you? 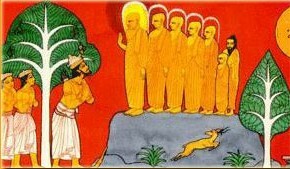 Mahinda thera realized that the king has a good knowledge to understand the Dhamma(truth), and gave the first sermon to the king. After the preaching, the king became loving to understand the Dhamma. Mahinda Thera is respected as a deputy Buddha in Sri Lanka. Just like as the Lord Buddha, He has rare ability in explanation of the Dhamma by using simple words which is familiar with the ordinary local people. This ability was the cause of that the king Asoka (his father) picked him to go to Sri Lanka for spreeding the Dhamma. The Sinhalese king also had the great ability to understand the Dhamma. He got this power or good energy by practicing Pāramitā (perfect virtues) for long time before this life. Therefor he got a chance to meet a good teacher of the Dhamma too. There was the combination of good occasions for the king to understand and become loving the Dhamma. There is another story to remember. Dipankar Buddha is the one of other Buddhas of the historical Buddha. Countless years ago at the while Dipankar Buddha had existed, Gautama was the hermit practicing in a forest. He would be able to attain Nibbāna through his own efforts. But he prefered to continue practicing for all of us who need to touch with the Dhamma. This is a special story of Buddha.